Set in one of the most beautiful, undisturbed places in the Caribbean, Jumby Bay, A Rosewood Resort is an island of simple pleasures. Reachable only by boat, and with no cars in sight, this private isle of endless white beaches and starfish-laden waters is a one-of-a-kind hideaway that exudes simple elegance. I can’t even begin to tell you how special it felt to be in a place that allows you – almost forces you – to slow down. After leaving the airport and taking the 7 minute boat ride over to the private island, we knew we were entering paradise. The entire property was covered in these massive, pink Bougainvillea flowers. Our favorite part was the view from our room. Our villa had a beautiful pool that overlooked the most incredible ocean view. In fact, the day we arrived Justin and I slipped into our swimsuits and enjoyed fish tacos and spiced rum punch (made on the island) on our patio by the pool. After experiencing months of stress from planning the wedding, it was so nice to be alone with my husband and enjoy his company. The best part of Jumby Bay is that it’s all inclusive. Yes, that means endless pina coladas, fish tacos, sailing, water skiing and snorkeling, which was available on the beach everyday. On our second day there, we took a boat over to Paradise Reef where Marine Biologist, Nicola, swam with us around the reef. The fish were absolutely beautiful, and my one regret was not having an underwater camera to document it (an excuse to go back, right?). 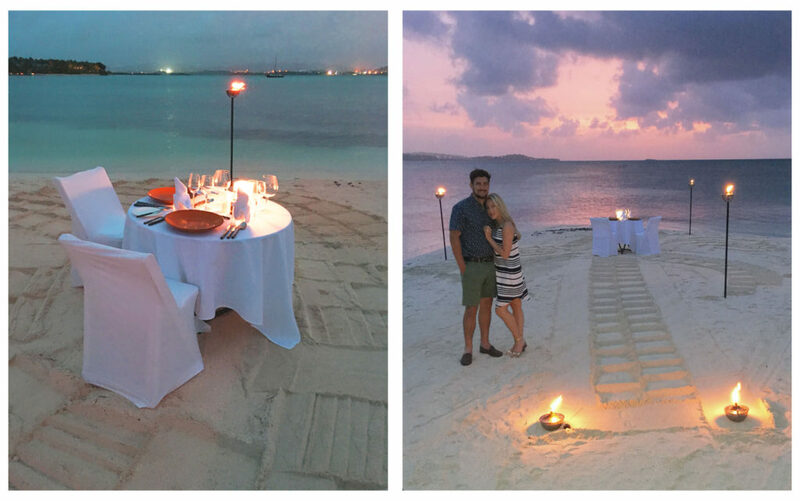 Later that evening my husband surprised me with a private dinner on the beach, and that night just so happened to have the most beautiful sunset of all the nights we were there. Between one of our courses we also got up and danced to the song we played for our first dance (thanks Spotify :)). We made friends with or waiter that evening, Ramey Brown, who shared so much about the local life of Antigua, MnM Music. Take a listen – it’s catchy. Beautiful beach cabanas with unobstructed views of the waters edge line Jumby Bay Beach and were where we spent most of our days. After a full day in the sun, we loved coming home to an outdoor shower. It made getting ready exciting! Each guest was provided a bike to ride around all 300 acres of the island, however our villa was located so close to the beach that would walk every morning and afternoon to watch the sun rise and set. In Antigua, there is no solstice, because the island is located so close to the equator no day is longer or shorter than another. The sun rises every morning at 5:30am and sets at 6:40pm, so although Antigua was within the same time zone as North Carolina it truly felt like we were much farther away. Overall, Jumby Bay was truly the perfect little hideaway for Justin and I so we could relax and enjoy our first few days of being married before we left for the “tropical rainforest” that was Hermitage Bay. Next week, I’ll be sharing the rest of our honeymoon experience with you, including our evening on a catamaran, our private helicopter tour to Coco Beach, and the wonderful friends we made from Texas!